I agree with Goethe’s sentiment. I’m a huge architecture buff; anyone who has seen the collection of miniature buildings on display in my office can attest to that. But in November 2011, a different kind of frozen music was created in New York City’s Bryant Park. 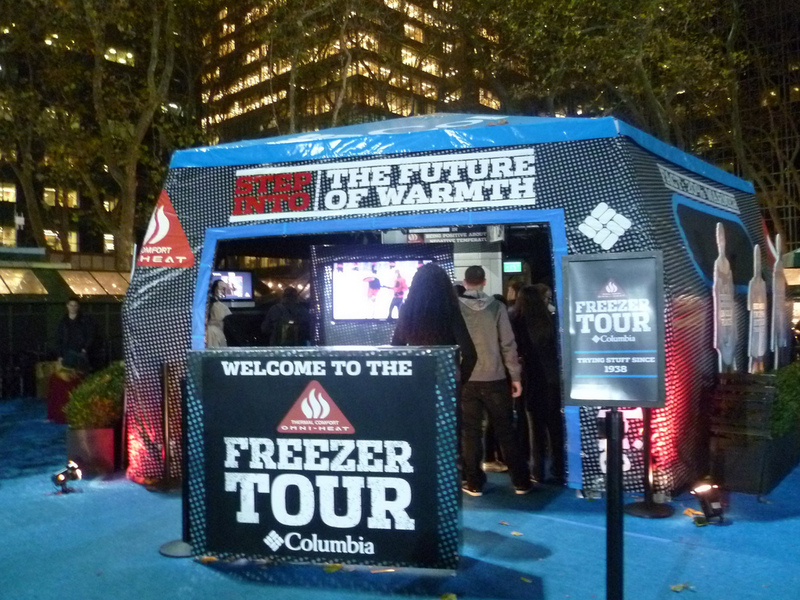 In a promotion sponsored by Columbia Sportswear, visitors had the chance to sing karaoke inside a giant freezer, dubbed the “Omni-Freezer.” As can be seen here, the Omni-Freezer was located inside a tent-like structure, near the ice skating pond that is installed in Bryant Park during this time of year. I understand that the Omni-Freezer has actually gone on tour through a number of American cities. 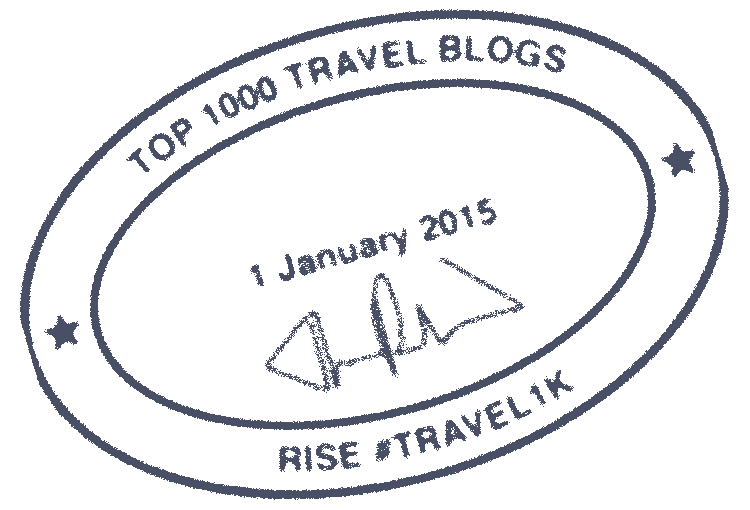 Given the response it has elicited, I would not be surprised to see it make some more appearances in the future. I’d been to an “ice bar” before, in Las Vegas, where the ambient temperature was maintained at a constant 23 degrees Fahrenheit (minus 5 degrees Celsius). 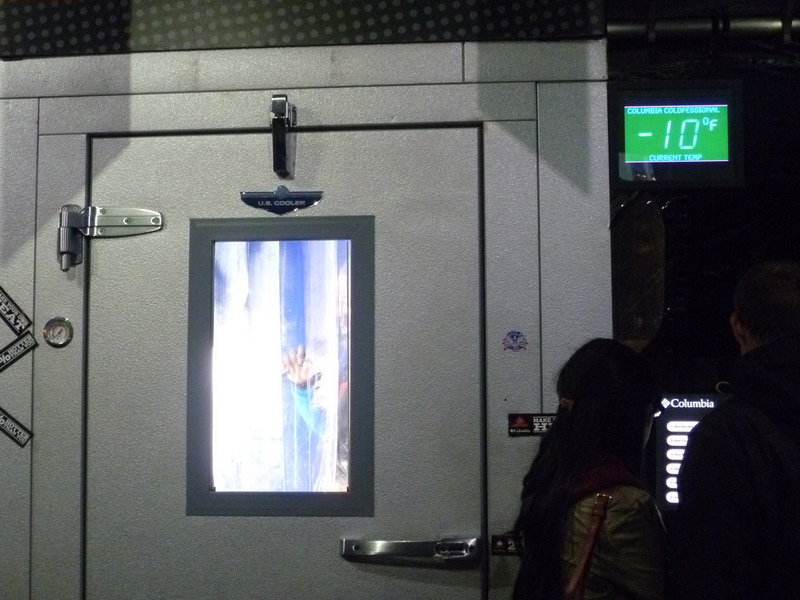 But the conditions in the Omni-Freezer were quite a bit more frigid than that. The temperature inside the 7-foot-high chamber hovered between minus 10 and minus 15 degrees Fahrenheit (a range of roughly minus 23 to minus 26 degrees Celsius). Nevertheless, I eagerly volunteered for the opportunity to participate. It didn’t hurt that there was no charge to sing. An additional incentive was that Columbia would provide me with a video and photos of my icebox jam session, also free of charge. A-list songs was among the listed tunes. Given the choices available, I opted for Katy Perry’s “Hot n Cold.” I had actually sung that one before, so at least I was more familiar with it than with any of the other 11 songs that were being offered. Plus, for a song by a female artist, “Hot n Cold” is not in a very high key, so it’s at least in the vicinity of my vocal range. While awaiting my turn, I donned a Columbia jacket (or perhaps “parka” or “anorak” would be the correct term for the garment. I wouldn’t know for sure; I’m no fashionisto. And no, that last word is not a typo. “Fashionisto,” ending with an “o,” is the little-used term for a male equivalent to a fashionista. I just learned that while writing this post. But it’s confirmed by that bastion of scholarly authority, the Urban Dictionary). I monitored the digital temperature readout next to the freezer door, and wondered how I would cope with the Arctic conditions without gloves or ear-grips to protect my extremities (Those accessories were not provided by the organizers. Although, in fairness, I can’t really blame them. Would you want to wear gloves that dozens of people’s hands had been in?). Still, the singers who preceded me did not appear to be suffering from frostbite when they emerged from the freezer. One pastime that was not possible while I stood in line was to watch the singers who were performing ahead of me. It soon became apparent that contrary to what I had expected would be the case, the singers in the Omni-Freezer could not be heard outside the freezer. The audio was not piped to any external speakers. Eventually, the time arrived for me to step into the icebox. Once inside, negative 10 degrees didn’t feel as bitterly cold as I had anticipated. I think that the lack of wind made a huge difference. The song terminated, thereby ending my session, after only about a minute and a half; but even though I was constantly shivering, I definitely felt like I could have remained in the freezer for at least a few minutes longer. Overall, the Omni-Freezer was a unique, albeit brief, experience. In one respect, though, it was a disappointment. For me, karaoke is a performing art that necessitates an audience. Indeed, the best karaoke experiences for me are interactive and involve the listeners responding to the song. I thrive on the energy generated by an enthusiastic crowd. Here, as mentioned, that crucial dimension was missing as the sounds of the singers were not shared with anyone outside the freezer. So in that sense, the Omni-Freezer was really more a recording studio than the activity that I think of as karaoke. Don’t get me wrong, I still had fun; and I can’t really complain about the chance to do some singing in a public place for free. The karaoke freezer also scores major points just for the sheer novelty of the concept. Plus, while I enjoy traveling the world to sing, it’s always a nice bonus when I find new karaoke adventures right here in my home city of New York. 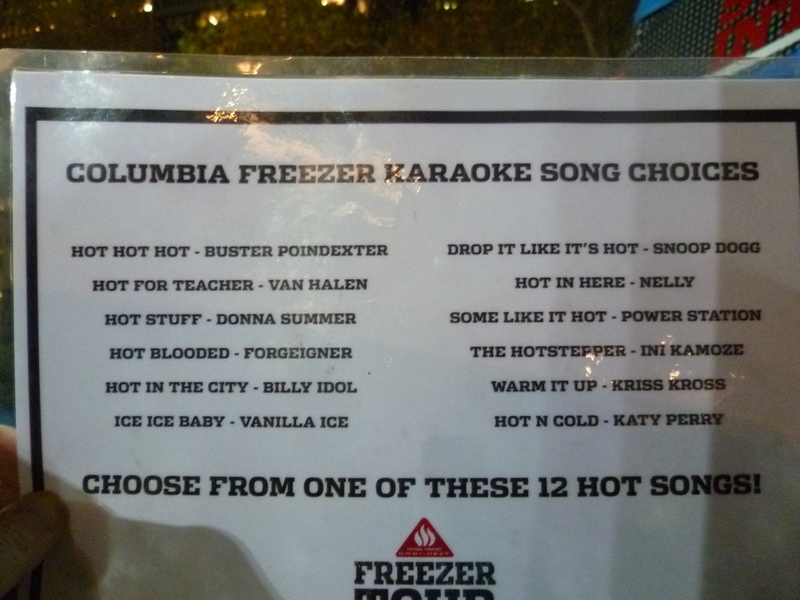 If Columbia takes the Omni-Freezer on the road again, I would recommend that the song list be expanded, and that the singers be given an audience that can listen to them. And when you look at the photo and video, you can’t help but notice that they’ve been heavily processed (the form in which you see them here is the only form in which they were made available to me). I think that the special effects that were added are unfortunate. 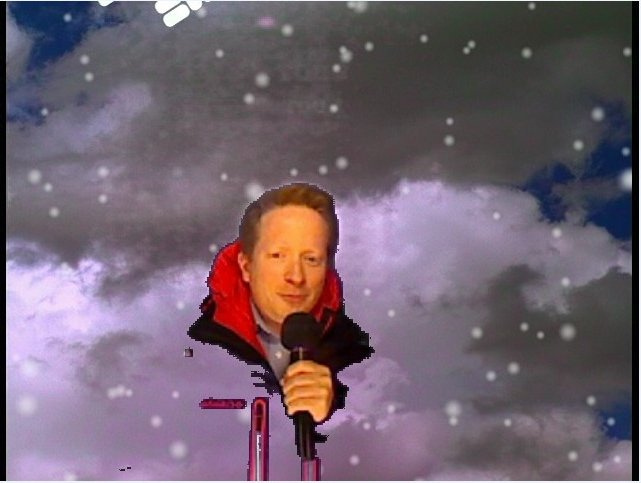 I’m a little creeped out by the sight of a disembodied head singing, even if the head is my own. This is not the way that I wanted to evoke the hallowed memory of Walt Disney . . .